Assignment of Contract. Station Square at 6080 McKay, Tower 4, is now featuring a one-of-a-kind 2 bedroom plus den unit at the highly desirable downtown centre of Burnaby, Metrotown. 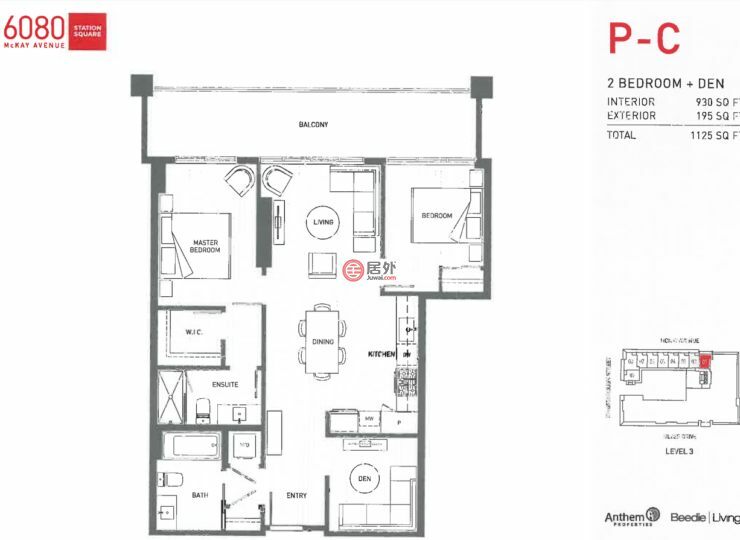 This massive and unique corner unit yields 930 square feet of livable space with an additional 195 square feet of balcony area to entertain a party of guests. Complete with modern appliances for the interior, elegant finishes, fitness room on the same floor level, and walking distance to Metrotown Skytrain Station, Metrotown Mall, Crystal Mall, restaurants, bars, banks, and day-to-day services, Station Square 4 is easily the first-choice for buyers with the most discerning tastes. Be one of the first to live at Station Square for instant access to everything: Skytrain, shopping, groceries, cafes, entertainment, and restaurants. Completion 2021. According to the Metrotown Development Plan Update (2016) provided by City of Burnaby, Metrotown will experience population growth of over 50% and producing 42% more jobs as compared to 2011 over the next 22 years. As an owner of Station Square 4, you will enjoy significant growth in demand for real estate being at the heart of Metrotown, elevating the value of this vibrant and active urban community. Welcome to Station Square Tower 4 at Metrotown, a place full of social, recreation, entertainment, and cultural amenities essential to all of Burnaby’s residents, businesses, and employees.